If so equipped, always use the cargo net when transporting cargo. The cargo net cannot secure hard or heavy objects. Parcel nets cannot secure hard or heavy objects. The glove box can be cooled. – To open: pull handle 1 and open glove box flap 2. – To close: fold glove box flap 2 upwards until it engages. 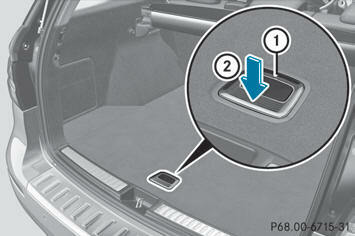 A partition for stowing flat objects is located in the upper section of the glove box. It can be removed to increase the stowage space in the glove box. – To remove: pull out partition 1 forwards – To install: insert partition 1 and push it back until it engages. – To open: press marking 1. 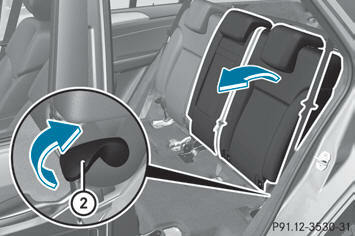 Storage bags are located in the rear compartment on the driver's and frontpassenger seat backrests. Do not place objects with a combined weight of more than 4.4 lbs (2 kg) into the parcel net on the back of the front passenger seat. Otherwise, the OCS may not be able to properly approximate the occupant weight category. Parcel nets are intended for storing lightweight items only, such as road maps, mail, etc. Heavy objects, objects with sharp edges, or fragile objects may not be transported in the parcel nets. In an accident, during hard braking, or sudden maneuvers, they could be thrown around inside the vehicle and cause injury to vehicle occupants. Parcel nets cannot protect transported goods in the event of an accident. 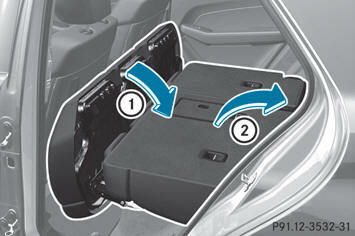 Parcel nets are located in the front-passenger footwell and on the back of the driver's and the front-passenger seat. Do not transport any unsecured items in the through-loading area. 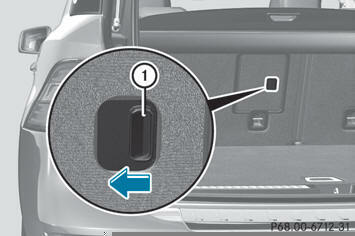 – Unlatch the rear seat backrests and tilt them in the cargo/load position. – Fold down the rear seat armrest. – Pull the center head restraint on the rear bench seat into the uppermost position. – Slide release catch 1 to the left and swing flap 2 to the left until it is lying on the rear side of the rear bench seat. 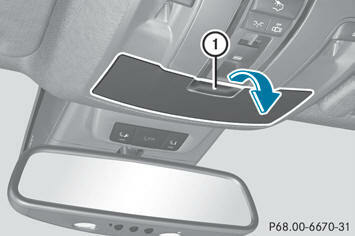 – Push cover 3 forward until it is lying on the rear seat armrest. When expanding the cargo volume, always fully fold the corresponding seats and, if so equipped, always use the cargo net when transporting cargo. Unless you are transporting cargo, the seat backrests must remain properly locked in the upright position. Always use the cargo tie-down rings. 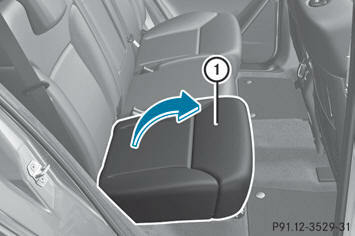 Fold the seat cushion upwards before folding the rear bench seat forward. Otherwise, the backrests may be damaged. When the backrest is folded forwards, the front seats should not be moved to their rearmost position. Otherwise, the front seats and the rear bench seat could be damaged. The left-hand and right-hand rear seat backrests can be folded forwards separately to increase the cargo compartment capacity. – Move the head restraints to the lowest position. – Fold seat cushion 1 upwards. – Pull release catch 2 upwards in the direction of the arrow until the backrest is completely unlocked. – Fold the backrest forwards until it reaches the cargo compartment position. – Guide seat belts 2 under respective clips 1. – Fold seat backrest 2 back until it engages. – Swing seat cushion 1 back. – Pull up and adjust the head restraints if necessary. - secure the load using the cargo tie down rings. - do not use elastic straps or nets to secure a load, as these are only intended as an anti-slip protection for light loads. - do not route tie downs across sharp edges or corners. - pad sharp edges for protection. There are four cargo tie down rings in the cargo compartment. Before using the cargo tie down rings on the front right-hand side of the cargo compartment, the parcel net must be pushed down. The bag hook can bear a maximum load of 6.6 lbs (3 kg). Do not use it to secure a load. There is a bag hook in the cargo compartment on the left-hand side. – Press the marking on bag hook 1. – Turn bag hook 1 until it engages. Only use the mounting hooks to secure items of luggage up to maximum of 9 lbs (4 kg) in weight. There are two securing hooks 1 on each side of the cargo compartment. A cargo compartment cover or a combined cargo cover and net (cargo compartment cover with cargo net) is attached, depending on equipment, behind the rear bench seat backrest. 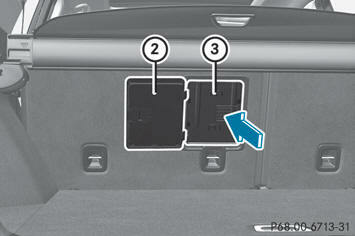 – To extend: pull the cargo compartment cover back by grab handle 1 and clip it into retainers 2 on the left and right. – To retract: unhook the cargo compartment cover from retainers 2 on the left and right and guide it forwards by grab handle 1 until it is fully retracted. – To remove: make sure that cargo compartment cover 1 is rolled up. – Press in end cap 3 of cargo compartment cover 1 on the right or left side in the direction of the arrow and press cargo compartment cover 1 into anchorage 2 opposite it. 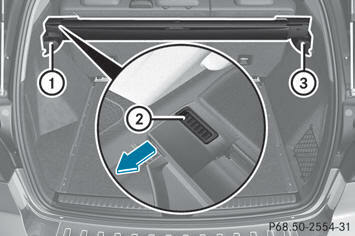 – Remove cargo compartment cover 1. 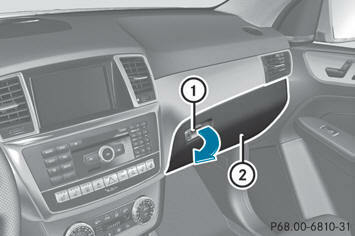 – To install: set cargo compartment cover 1 on the right or left-hand side in anchorage 2. – Push in opposite end cap 3 of cargo compartment cover 1 in the direction of the arrow and insert cargo compartment cover 1 into opposite anchorage 2. You can install and remove the combined cargo cover and net from the cargo compartment. – Make sure that the cargo net and the cargo compartment cover are rolled up. – To remove: press button 2. – Swing the combined cargo cover and net in the direction of the arrow. 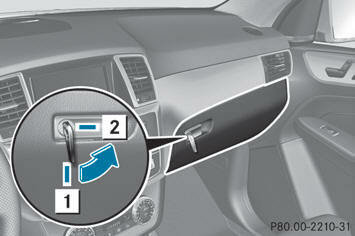 – First, detach the combined cargo cover and net from left-hand catch 1 and then remove it from right-hand fixture 3. 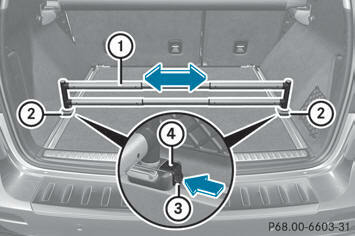 – To install: push the combined cargo cover and net up to the stop into right-hand fixture 3. – Place the combined cargo cover and net into the left-hand fixture and push it into catch 1 until the combined cargo cover and net engages audibly. – Make sure that red lock status indicator 4 is no longer visible. The combined cargo cover and net will otherwise not be locked in place. It is particularly important to use a safety net if the vehicle is loaded with small objects above the level of the backrests. For safety reasons, always use a cargo net when transporting loads. – Pull the cargo net up by tab 1 and hook it into eyelets 2 using both hands. The tailgate may close if too great a load is placed on the coat hooks. You and/or others could be trapped and injured. Only use the coat hooks for light clothing. The EASY-PACK load-securing kit allows you to use your cargo compartment for a variety of purposes. The accessory parts are located under the trunk floor. – Open the trunk floor. – Insert bracket 1 into the center of loading rail 4. – Press release button 2 and push bracket 1 into the desired position in loading rail 4. – Let go of release button 2. – Press locking button 3. Bracket 1 is locked in loading rail 4. – If necessary, fold cargo tie-down ring 5 upwards. - change direction suddenly - are involved in an accident Please observe the loading guidelines. The luggage holder can be used to secure light loads against the side wall of the cargo compartment to prevent them from moving around. Only use the luggage holder to secure cargo with a maximum weight of 15.4 lb (7 kg) and with dimensions that the luggage holder can safely and securely contain. – To install: insert two brackets 5 into the left or right loading rail. – Press release button 1 of the luggage holder and pull the strap out slightly. – Insert luggage holder 2 into brackets 5 and, while doing so, press release button 3 and push the luggage holder downwards until it engages. – Press release button 1 of the luggage holder and pull the strap out in the direction of the arrow. – Place the load between the strap and the cargo compartment side wall. – Using one hand, press locking button 1 of the luggage holder. – With your other hand, let the strap go slowly until the load is secured. – Make sure that locking button 4 on brackets 5 is pressed. This keeps brackets 5 in place on the loading rail. 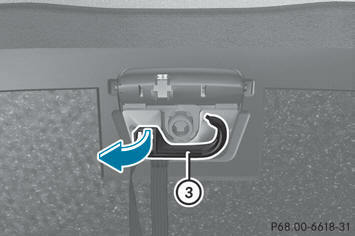 – To remove: press release button 3 on respective bracket 5 and remove luggage holder 2 by pulling upwards and out. The telescopic rod can be used to secure the load against the rear seats to prevent it from moving around. 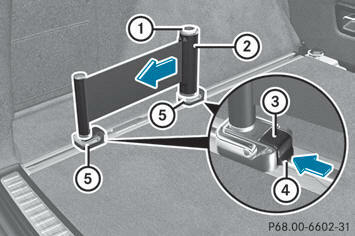 – To install: insert one bracket 2 into both the left and the right loading rails and slide it to the desired position. – Insert telescopic rod 1 into brackets 2 and, while doing so, press release button 4 and push the rod downwards until it engages. – Make sure that locking button 3 on brackets 2 is pressed. This keeps brackets 2 in place on the loading rail. – To remove: press release button 4 on respective bracket 2 and remove telescopic rod 1 by pulling it upwards and out. 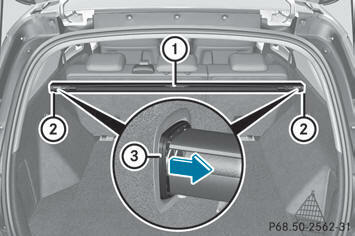 A removable insert under the trunk floor contains the parts of the EASY-PACK loadsecuring kit. The tire-change tool kit is stored beneath this insert. – To open: open the tailgate. – Holding the ribbing, press handle 1 downwards 2. – Swing the trunk floor upwards using handle 1 until it rests against the cargo compartment cover. 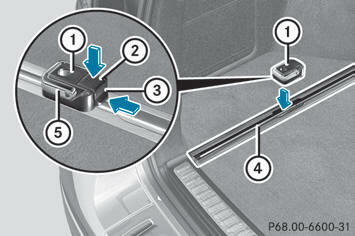 – Fold out hook 3 on the underside of the trunk floor in the direction of the arrow. – Attach hook 3 to the cargo compartment's upper seal 4. – To close: detach hook 3 from the cargo compartment's upper seal 4. – Fasten hook 3 to the bracket on the underside of the trunk floor. – Fold the trunk floor down. – Press the trunk floor down 2 until it engages. Only use carriers when the basic carrier bars have been completely mounted. The left and right roof rails are only stabilized by means of the basic carrier bars mounted. Follow the manufacturer's installation instructions. Otherwise, an improperly attached carrier or its load could become detached from the vehicle. Do not exceed the maximum roof load of 220 lb (100 kg). Take into consideration that when the roof is loaded, the handling characteristics are different from those when operating the vehicle without the roof loaded. – Secure the roof carrier to roof rails 1. – Observe the manufacturer's installation instructions.